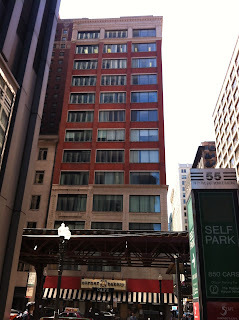 The Essence of Hermetic Light Church was once housed in the penthouse of this building at 27 E. Monroe Street (this photograph taken from around the corner, at Wabash). Yes, they met in the penthouse of the Palmer House Hotel. They are listed as having their headquarters there in 1976. I've yet to find much about this organization, but they must have had considerable connections to have their offices there. The Palmer House website describes this as " a dramatic penthouse suite costing over $1.3 million dollars." Some modern day photographs of the penthouse can be found online: take a look at that floor!